React Native mobile app. It’s going to show login buttons and once clicked send the user to the backend to have them log in with their Facebook or Google accounts. That’s how it’s going to look like. For your reference, the final code for the app we’re building can be found in this GitHub repo. First of all, let’s set up Facebook and Google apps that will allow us to use their OAuth mechanism to log users in and to get their profile info, such as name, avatar, etc. We’ll be using localhost as our backend hostname for development. If you’re planning on running the app on Android Simulator with Genymotion, you should use 10.0.3.2 IP address instead. And for production, you should be using your actual domain name that you’ll be running the backend on. Click My Apps and then Add a New App. Enter your app’s name and click Create App ID. 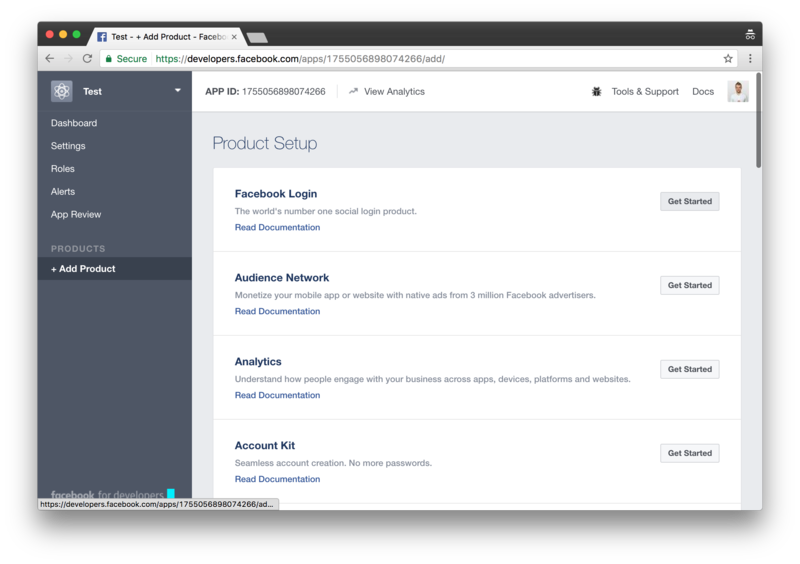 Click Get Started on the right of Facebook Login section. Enter http://localhost:3000/auth/facebook/callback into Valid OAuth redirect URIs field and click Save Changes. Copy APP ID at the top of the page and paste it somewhere. We’ll need it later on. Click Setting in the left side menu below the Dashboard. Click Show in App Secret section and copy the secret. Again, paste it somewhere to use later on. Click Select a project at the top of the page. Click + on the right to create a new project. Enter your project’s name and click Create. Click Select a project at the top of the page again. Click on a project that you just created. Scroll down to Social APIs section and click on Google+ API. Select Google+ API and Web server from the dropdown menus respectively and click What credentials do I need? button. 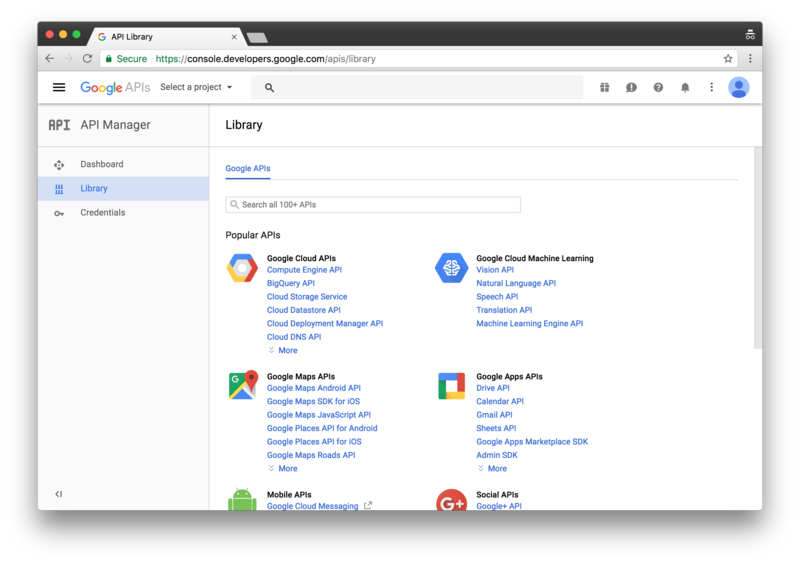 Enter http://localhost:3000/auth/google into Authorized redirect URIs field and click Create client ID button. Choose an email address, enter you name and click Continue. Click Done button at the bottom. Click on the client that you just created. Copy Client ID and Client Secret and paste them somewhere to use later on. And we’re done with those apps. Keep the Client IDs and Secrets that you copied handy. We’ll need them in the next steps. Now, let’s set up the backend that handles user authentication via Facebook and Google OAuth apps that we created in the previous steps. Express. Node.js web application framework. Passport. An authentication middleware for Node.js. Passport-Facebook. 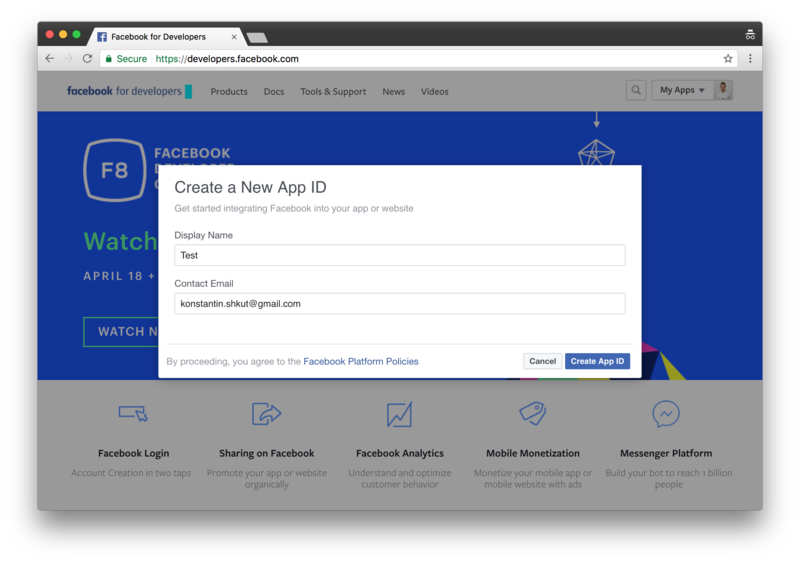 Facebook authentication strategy for Passport and Node.js. 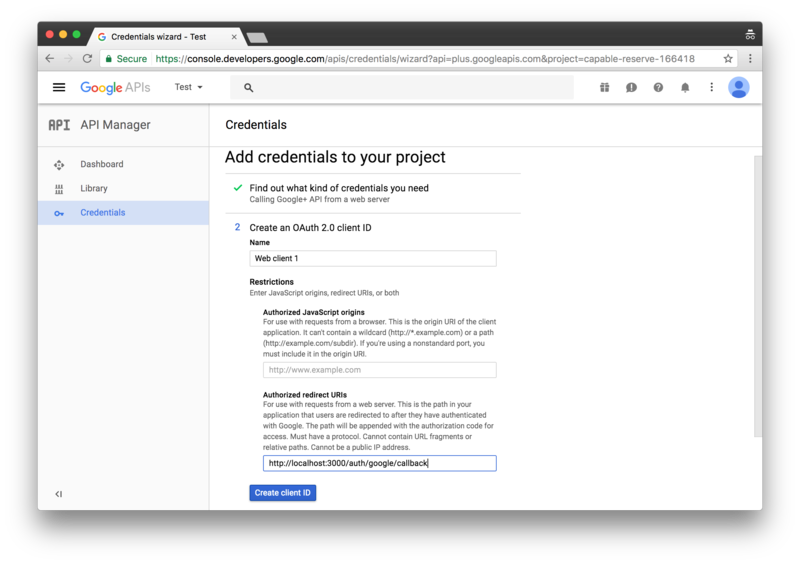 Passport-Google-OAuth20. Google (OAuth 2.0) authentication strategy for Passport. It’s going to ask you a few questions. You can just press return to give the default answers for each question. Next, let’s add the start script to run the backend. 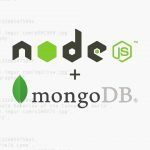 "start": "node_modules/nodemon/bin/nodemon.js -- node_modules/babel-cli/bin/babel-node.js server.js"
We’ll be using nodemon to automatically restart the server when we change anything in the code. We’re going to store Facebook and Google OAuth app IDs and secrets that we got in the previous steps in this file. Create a new file called config.js with the following content. Replace INSERT-CLIENT-ID-HERE and INSERT-CLIENT-SECRET-HERE placeholders with your actual IDs and secrets. Let’s create a script that will run an HTTP server and handle incoming requests. Create a new file called server.js with the following content. Read through the comments to see what’s going on. Basically, we’re just setting up Passport to handle users authentication, transform Facebook and Google profiles into a unified user object and stringify it when redirecting users back to the mobile app. Let’s launch the server and see how it works. That means the server works. That’s great. Keep it running and let’s continue to the mobile app. Now that we have our backend ready let’s build the mobile app. First of all, let’s install a couple of new dependencies. React Native Safari View. A React Native wrapper for Safari View Controller. It opens a URL in a view inside of the app without going to Safari app. We’ll use it to send users over to the backend that we built in the previous step for authorization. If you have worked with Linking before you might be wondering why am I suggesting to use Safari View instead of just using Linking.openURL that opens a URL in Safari app. That’s because it’s considered bad UX and Apple won’t approve your app if you were to publish it to Apple Store. React Native Vector Icons. We’ll use for Facebook and Google icons on the buttons. Now, let’s link libraries and other dependencies required by the packages that we just installed. Linking allows us to handle incoming requests. By using a special URL Scheme we are able to redirect users from the backend to the mobile app once they were authenticated. On iOS you’ll need to link RCTLinking to your project by following the steps below. 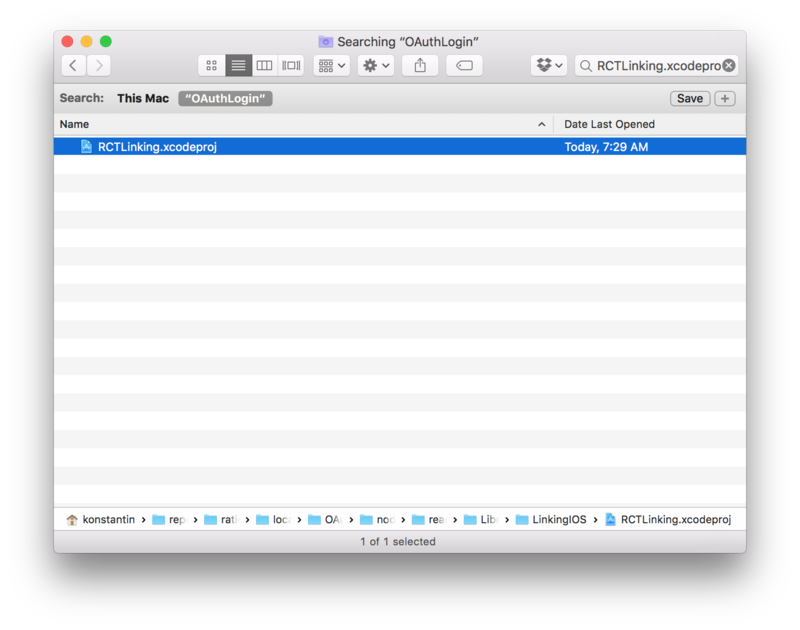 Find RCTLinking.xcodeproj file inside your project’s folder. It’s located in node_modules/react-native/Libraries/LinkingIOS/ folder. 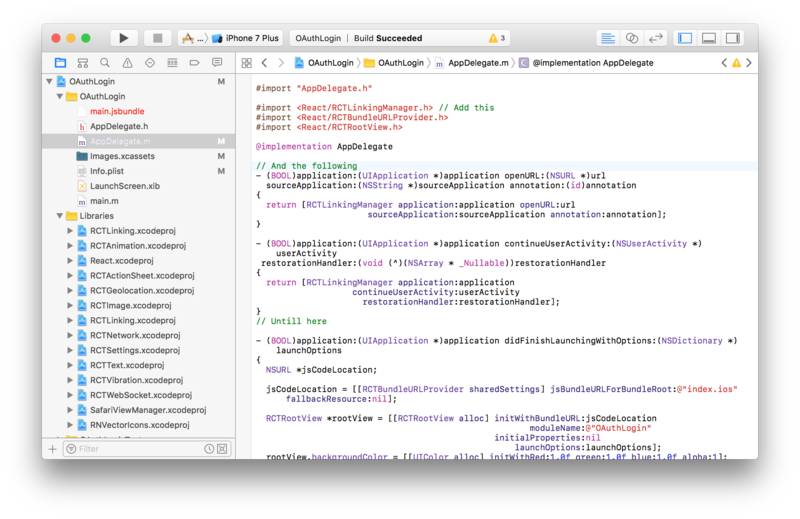 Drag RCTLinking.xcodeproj file into Libraries folder on the left. Add #import <React/RCTLinkingManager.h> next to other imports. Add the following right after @implementation AppDelegate line. Click on OAuthLogin on the top of the left sidebar and then click Info tab on the right. Scroll down to URL Types section and add a new URL type with OAuthLogin URL Schema. That’s the schema used by our backend to redirect users back to the mobile app. On Android you’ll need to edit android/app/src/main/AndroidManifest.xml file to add an intent-filter to handle incoming requests. Now, let’s run the app in the simulator. Once your app is up and running, press ⌘D and select Enable Hot Reloading. This will save you some time having to reload the app manually every time you make a change. Next, let’s update our index files. Since we’re going to re-use the same code for both, iOS and Android, we don’t need two different index files. 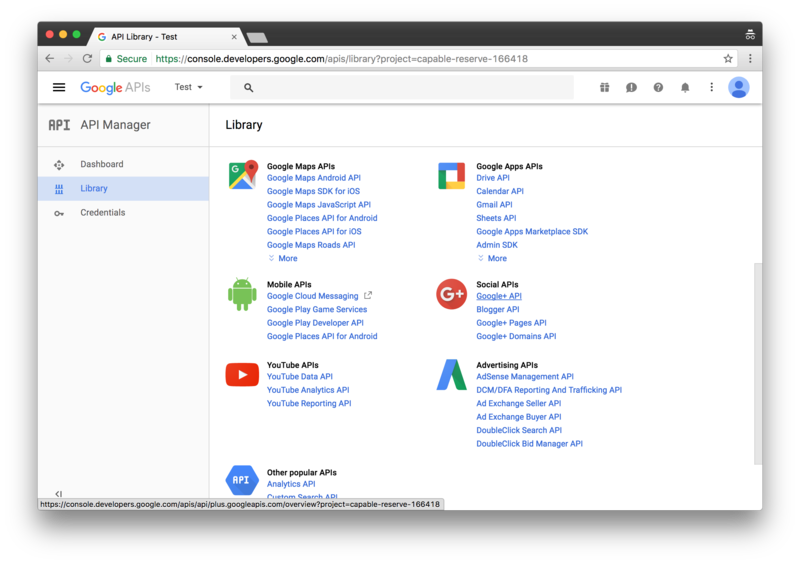 We’ll be using the same App component in both index files. Open index.ios.js file and scrap all of the React Native boilerplate code to start from scratch. Do the same for index.android.js. And add the following code to both of those files. This code imports App component from src/app.js file and registers it as the main app container. 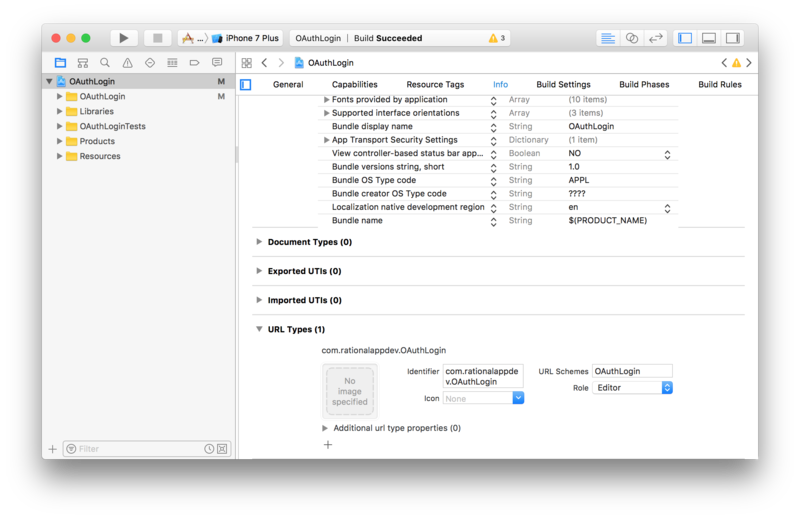 Now, let’s create App component. Create a new file called app.js with the following content. It’s a pretty straightforward component. There are a welcome message and two login buttons at the bottom. Bring up the simulator window and enjoy the result. Hi nice tutorial , i am getting error in running the backend, it says node_module is not recognised as an internal or external command , my node version is v6.10.3 and npm version is 5.0.1, please help. Hi Aayush, what platform are you on? Is it OS X, Linux or Windows? Maybe try changing “node_modules/…” to absolute path, something like “C:Projectsbackendnode_modules…”. Or if you google that error there is a lot of similar reports for Windows. Let me know when you find out what the problem was, so I can update the tutorial! I’ve been following along with your tutorials and they’ve worked great for me so far. 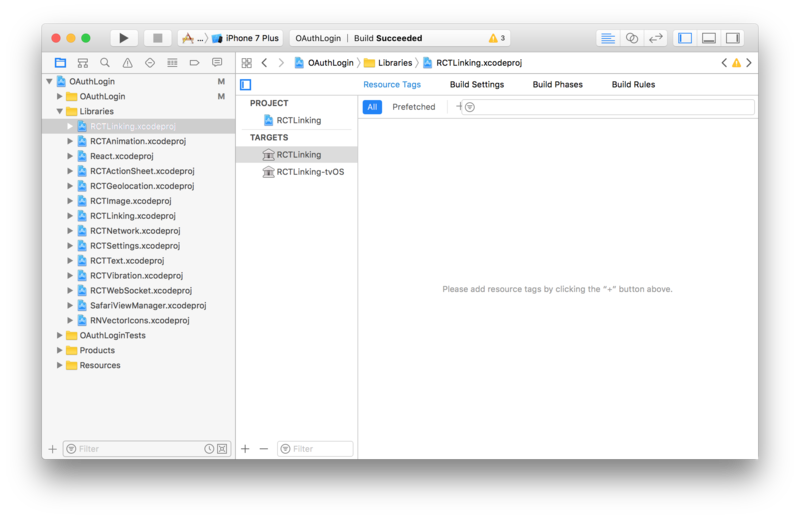 I’m working in the expo development environment so I haven’t worked in xcode at all. Is there any way to complete the platform specific portions of the FB auth if I can’t access the .xcodproj files? this does not generate any Android nor IOS folder. Does it mean I cannot use the “Linking” tricky? Hi, great tutorial. Do you have one where you use Firebase to handle the social auth? Hi! I’m glad you liked it. Not yet. Hello! Thank you for a wonderful post. I have succeeded facebook login, but i wonder how to send token/cookies to the app when the authentication is done, and the way to store this token/cookie in the native app so that users don’t need to login even after they leave the app. Can you teach me? how i can run your project from github ? i run npm start in the server and in the app . in the appp i get ” Loading dependency graph, done.” . how i can get QR for Expo to see the demo ? in localhost:8081/ i get only “React Native packager is running.”. 1- Connect your phone via usb to computer and enable usb debugging. 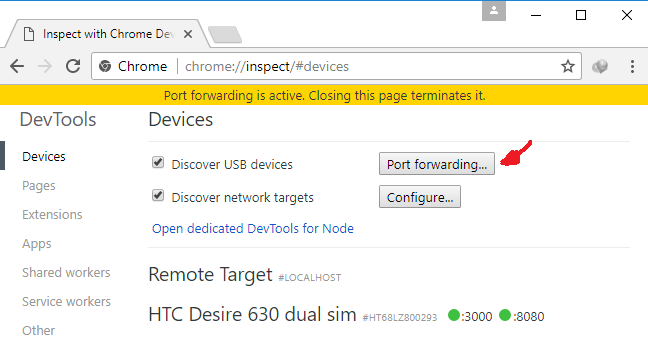 Now you can link your computer port to your device port by port forwarding button. 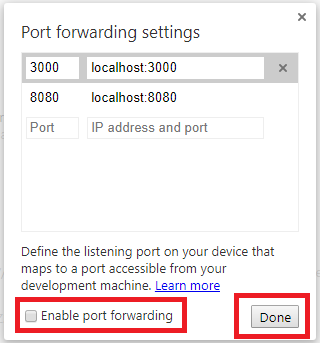 Note don’t forget to check the Enable port forwarding check box on port forwarding setting popup window. Is it possible to restrict opening the authentication endpoint to just the mobile app? And prevent all other computers from accessing `/auth/provider/` ? 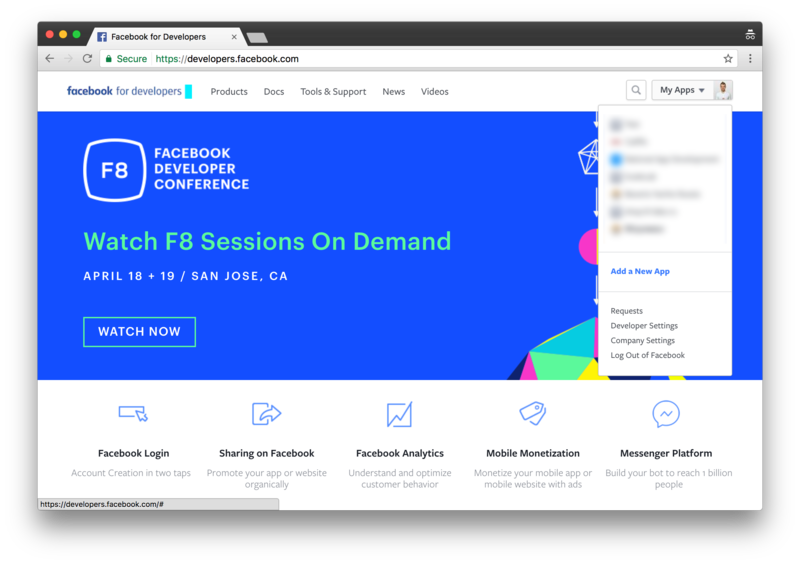 P.S : You’ve mentioned `/auth/facebook` as redirect URI in facebook developer portal but in the screenshot it’s `/auth/facebook/callback` . Same case in Google. May I know which is right? You can add a secret key to all requests to `/auth/provider/` and deny access if the key wasn’t provided or incorrect. P.S. : `/auth/facebook/callback` is the right one. Sorry about that, I fixed the typo. >> That’s because it’s considered bad UX and Apple won’t approve your app if you were to publish it to Apple Store. Are you sure about it? Because apple rejects Linking.canOpenURL due to it can be used for installed apps scanning. I was submitting an app recently and it got rejected because of that. Great tutorial! I followed this tutorial and the main UI works, but I get a message in Safari “Safari cannot open the page because it could not connect to the server” when I click on either of the buttons. This happens on my iPhone 7 and on my emulator. Any ideas how to prevent this? Thanks! I’m having the same issue. Any luck?? Hi Chris, yes I did. What’s the issue you’re seeing? I am facing the same issue in android emulator. 2. What about logging out? How would you implement that? is there a way to do this without having to use async/wait? im not familiar with that es7 feature. quick question. what if you want to save user information on your own database? same question. Anyone got any solution? Hello! very helpful tutorial. I’m following only the Facebook Connect piece. I’m getting “Safari cannot open the page because the address is invalid. But when I try to open “http://localhost:3000/auth/facebook” in Safari on my computer, it all works fine. Any tips? 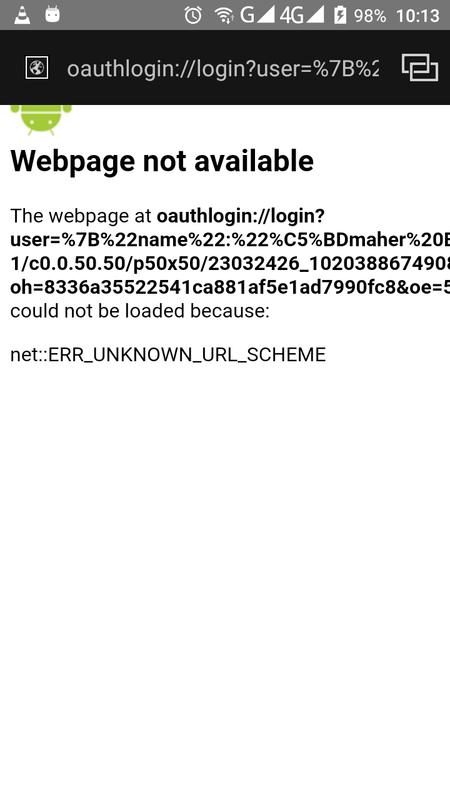 server.js file to use my app name instead of OAthLogin. GL!, I did’nt find server.js using app name? Is there any chance to extend this such that you can access the user’s Facebook friends etc.? Or do you have any useful links how you would do that if you’re setup your login with this framework. Thanks! i guess it is showing error because of permissions. Kindly give solution for this. It because your app don’t access “localhost” from your machine. we are setting up oAuth like you in our app. The only thing we encountered was the fact that safari-view and the android-in-app-brower always remember the credentials/cookie? of the user and therefore instantaneously log us into our app. Users are not able to log in with another account. Is there a solution for this problem? Did you find a solution to this? I have the exact same issue, my users cannot log out and use a different google or facebook account. Thank you very much for the post. 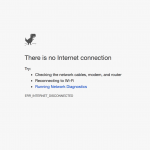 I followed it and I seem to have a problem after the server redirects. To understand what happens, I opened Safari and went to the developer mode on the safari page. 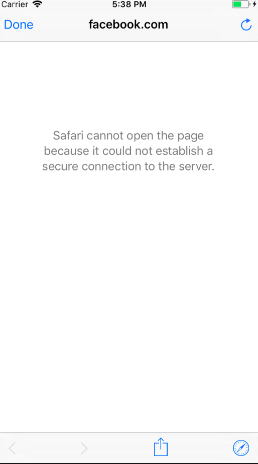 Thanks for the great post, and I saw the error message, “Safari cannot open the page because it could not establish a secure connection to the server”, after I click the either button. I git from your repo, https://github.com/rationalappdev/react-native-oauth-login-tutorial, and get the same error, both “safari cannot open …”, and xcode shows TCP Conn Failed. Thanks, and looking for a solution. “Safari cannot open the page because it could not establish a secure connection to the server” was showing up after I clicked the ‘Login With Facebook’ button. These inputs into the “URL Types” part of Info.plist work now, so it’s correctly re-directing back into my app. Really, thanks a lot my friend!!! Just added FB auth to my app – great tutorial, thanks! I have one problem though. I make the call and save the data in the DB, but the session used by the auth calls is different to that used by the rest of the app because the cookie is different from safari-view. So when I make my next call (eg Get: initData) node just has an empty session. Great tutorial, can i get access token and token id, if yes then how? For anyone having issues with the automatic redirection on every google authentication try, you can these protocols as params of the authentication of google to prompt for the user account. Awesome tutorial !! Thanks a lot. Everything works on my side except this, when I login with google, the embedded safari doesn’t redirect to my app, it seems like the safari doesn’t aware the command ‘res.redirect(‘OAuthLogin://’)’. I change this redirect to sms://1234, try to open message, it also doesn’t work. this only happens at the first time login with google (account typing required), once I have logged in the example can redirect to app directly. BTW facebook works well. Do you have any ideas about this? Is this a limitation from google for a security consideration? I’ve done it for GitHub auth recently and it works perfectly. Thank you very much. this happens when i press the button in simulator. Solved! turn off my anti-virus software and it did work.